The Quarter master Depot was authorized by Congress in 1865 and served the entire southwest as a materiel transfer and distribution point for troops stationed at the military outpost of the Arizona Territory. For more information, please call (928) 329-0471. Admission fee charge. The Yuma Conservation Garden offers the casual visitor a tantalizing glimpse onto a land of little rain, a place of spectacular and unusual beauty  the Sonoran Desert. Part botanical garden, outdoor laboratory, animal refuge and farm equipment museum, the garden is a network of paths through time. Located on 32nd Street next to the Yuma County Fairgrounds. Hours may vary seasonally. For more information, please call (928) 317-1935. Located at Giss Parkway, and Prison Hill Rd. Between 1876 and 1909, this penitentiary housed many of Arizona's most dangerous criminals. Famed in literature, movies and television, the remains of the prison are now an Arizona State Park. The cells, main gate and guard tower have endured as grim reminders of frontier justice. Museum exhibits document the story of the prison. Open: 8 a.m. to 5 p.m., every day except Christmas. Admission fee charge. Interpretive programs are at 11 a.m., 2 p.m. and 3:30 p.m. For more information, please call (928) 783-4771. Located at 240 S. Madison Ave. A regional museum of the Arizona Historical Society. Century House is one of Yumas oldest and most historical buildings. 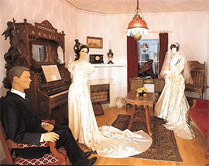 Once the home of pioneer merchant E.F. Sanguinetti, the museum now exhibits artifacts, photographs and furnishings of Arizonas territorial period. Colorful gardens and aviaries with exotic and talking birds are maintained as they were at the turn of the century. Historical Library and Gift Shop are open 10 a.m. to 4 p.m., Tuesdays through Saturdays, year round. Admission: Donation. Call for tours, films and lectures. For information, call (928) 782-1841. Located 4322 East County 13th St., (1.5 mi. east of Avenue 3E). The Peanut Patch brings you some of the finest peanuts and peanut products in the west. The peanuts are cleaned, shelled, packaged and made available through the retail store. Please call for tour information (928) 726-6292. History comes alive on the legendary Colorado River with the Knowlton Family. Narrated jet boat tours through the Imperial Wildlife Refuge, a scenic wilderness wonderland filled with history and bird watching. Choose from a variety of tour packages: A day trip to Lonesome includes lunch, and stops at a miner's cabin, Indian Petroglyphs, Picacho and Lonesome's Knoll. Tour is from 9:30 until 2:30. The Drapper Deluxe includes lunch and stops at the Imperial Wildlife Refuge, old ranch sites, rock cabins built in the 1800's and more. Tour time is 9:30-5:00. You can even take a custom three hour tour with lunch, or a sunset dinner cruise. YRT office is located at 1920 Arizona Ave. and the tours depart from Fisher's Landing, approximately 32 mi. Northeast of Yuma. Take Hwy. 95 North to Martinez Lake Rd. Turn Left, drive for 10 mi. to Fisher's Landing. The boat can be found behind Olsen's store. For information, call (928) 783-4400. The first plane to land on Arizona soil dropped out of the sky into a ball park between 1st and 3rd Streets on 4th Avenue, October 25, 1911. Robert G. "Bob" Fowler was flying a Wright model B, 30 hp two-prop biplane. He landed his biplane in Yuma during a history making flight that began in Santa Monica, CA and ended by rolling the wheels of his biplane into the Atlantic surf of Miami, FL. A monument acknowledging the first flight into Yuma, Arizona is located at 195 4th Ave. Located South on Highway 95 and County 15th St. Bonanza and Mini Bonanza Bingo, do it yourself pull tabs available, Letter "E" progressive every weekend. Ask about holidays "FREE" Bingo. Slot machines, video poker machines and video keno machines. For information call (928)726-8066. The date is one of the oldest cultivated tree crops, being cultured more than 5,000 years ago. The Imperial Date Gardens are one of the leading Medjool Date producers. Dates are harvested September through November. The Imperial Date Gardens and the Dome feature fresh dates, produce, nuts and candies. Take 4th Avenue north into California. Turn right on S-24 and follow approx. 6 miles to Ross Road. Turn right and follow, approx. 12 mi. Imperial Date Gardens is on your left. For information, call (619)572-0277. Come play at Paradise Casino  Yuma's newest gaming facility! Located at 540 Quechan Drive, Yuma. Take 4th Avenue into Calif., turn right on S-24, then follow the signs, the Casino will be on your right. Paradise is this area's only 24hour casino. 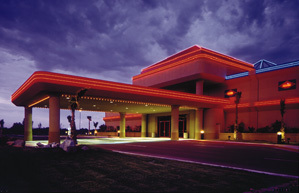 Try your luck on their reel slots, enjoy live gaming, or play a few hands of Bingo, Bridge or Keno. Visit the 24hr. restaurant, lounge, and espresso bar. Convenient shuttle bus service is available. Both the casino and bus service are handicap accessible. Call toll free: 1-888-777-4946 for more information. Located on Highway 95, 5 mi. South of Yuma. The Napa Auto Parts Desert Racing Series will feature weekly racing events from February - June, and September - December, and a 4th of July Celebration. The track's spacious infield is the site of stadium type off-road racing events. Prices for regularly scheduled events are :$7 for adults; $6 for military, Sr. citizens, high school students & children, 6-12 years of age; under 6 years old are admitted free. Prices vary for special events . For more information call (928) 726-9483. Fort Yuma - Quechan Museum was built in 1851 as the officer's mess at Fort Yuma, a U.S. Army military post. The museum, established by the Tribe depicts history of the Quechans, military and the early Spanish explorers. Museum hours: 8 a.m. to 12 noon, and 1 p.m. to 5 p.m. Mondays, and 8 a.m. to 5 p.m. Tuesday through Friday, closed holidays. Admission is $1.00, children under 12 are admitted free. (Please no rock hounding on the reservation.) Located off of S-24 in California. For information, please call (619) 572-0661. Located at 7301 Calle Agua Salada. Take 8th St. West 5 mi. next to Yucca Power Plant. World's largest reverse osmosis desalting plant was completed in 1992 and cost approx. $158 million. Reverse osmosis is the separation of one component of a solution from another component, (in this case salt from the water). This is achieved by forcing saline water through a semipermeable plastic membrane, allowing only the freshly desalted water to pass through. This process removes about 97% of the salt from the water. Guided tours, of the plant, are available upon request. For information, call (928) 343-8169. 301 Main is operated by the Yuma Fine Arts Association as a dedicated visual art facility. Exhibitions focus on artists from Arizona and the Southwest Region. Exhibitions include paintings, sculptures, photographs and other evolving art forms. 301 Main is open year-round, and is located directly South of the Main St. Plaza in Historical Downtown Yuma. For information, contact (928) 783-2314. Located five miles West of Yuma on I-8. One of the world's largest irrigation canals, serving 675,000 acres of cultivated land in Calif. and Arizona and extends 80 miles through the desert. Also delivers water to Mexico in accordance with the Mexican Water Treaty. The freeway will cross the canal. Fort Yuma built on the ground of the original Concepci�n Mission where Father Garces was massacred by insurgent Yuma Indians in 1781. 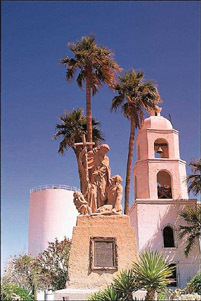 The mission is a reminder of Yumas historical past, which dates back to the coming of Jesuit Priests from Mexico in 1539. Arrangements must be made for guided tours. Services are held on Saturdays at 4:30 p.m. and Sundays at 10:30 a.m. Located off of S-24 in California. Located at the Yuma Quartermaster State Historic Park. Engine #2521 was built in 1907 by Baldwin Locomotive Works, Schenectady, N.Y., and logged an estimated total of 2,500,000 mi., including service through Yuma. She is a Class C-9 engine, weighs 193,700 Lbs. loaded, exerted 45,470 Lbs. of tractive effort in her heyday. She measures more than 79 ft. stem to stern. She was retired and presented to the City of Yuma in 1957. Located 7 mi. S.W., near Algodones, the multimillion dollar dam and diversion structure is on the Colorado River; named for a Mexican Patriot. Located at 868 South Avenue B. A garden of more than 300 date trees, including more than eight varieties. Harvesting begins in August and continues through October. The store is open 9 am - 5 pm daily. For information call (928)783-4778. Located on 32nd street between Pacific and Avenue 3E. Numerous events are held throughout the year, such as the Yuma County Fair, Silver Spur Rodeo, 4H Barbecue, and live horse racing to name a few. For information call (928)726-4420. Located 20 miles west of Yuma , the dunes surround both sides of I-8 . It is illegal to go into the sand dunes from the rest stop 17 miles West of Yuma, so go West on I-8 to Gray's Well exit to Frontage Road that leads to the dunes. Locale for movies and TV from the Valentino days to present. The "Great American Sahara" is a photographer's dream. "Dune Buggy" playground. A 10 acre wildlife interpretive area on Mittry Lake. Take Highway 95 to Ave. 7E, turn left and go 9 mi. past Laguna Dam, and turn left at the sign. A half mile self-guided tour; easy walking; bird watching and fishing. Bulletin board; vault toilet. For guided tours, and other information, call (928)627-2773. Enjoy the Colorado River with a relaxing ride on the Colorado King I Paddle Boat. This boat is a replica of history on the river; Dining and weddings are popular. Located 32 mi. northeast of Yuma. Take Hwy 95 East until you come to Martinez Lake Rd., 2 1/2 miles past the large guns. Take a left and drive for 10 mi. to Fisher's Landing. You'll find the paddle boat behind Olsen's store. Office located at 1640 S. 4th Ave. Call for costs & reservations (928)782-2412. Located 16 miles Northeast on Highway 95, with entry 3/4 mi. East of McPhaul's bridge. Covering 660 acres, this park has nine rifle, pistol and archery ranges. There is also a baseball diamond, radio control model airplane strip, picnic areas and camping sites available. Shooting matches and other activities are frequently scheduled at the ranges. For schedules or reservations, call Sprague's Sports and RV, Inc., (928) 726-0022. Located 75 miles Northeast of Yuma. Head East on Highway 95 about 55 miles. Turn off right to Palm Canyon. The 10 mile road from Highway 95 to the canyon entrance is dirt and curvy, but not hilly. At the end of the road is a parking lot. From there, palms may be reached only on foot via a tough one mile climb to the canyon, located more than half way up the cliffs on the left. Located 46 miles Northeast on Highway 95. The tallest peak (3,793 ft.) is famed Castle Dome located within the Kofa Game Range, although the Kofa and Castle Dome Mountains are not especially high, they are extremely rugged and rise sharply from the surrounding desert plains, providing ideal bighorn sheep country. For information contact Kofa National Wildlife Refuge, 356 W. First Street, Yuma AZ 85364. (928) 783-7861. Take I-8 West to Gray's Well Exit then take Frontage Road on the South side of I-8 and continue West, the monument is on the left. (Cannot be seen from I-8) The plank road was used as the only means for travel through the sand dunes by wagon and automobiles between 1915 and 1926. Located at Felicity, CA., 9 miles west on I-8 to Sidewinder Road exit. Turn right and take Frontage Road on the north side of the interstate. The village features a 21 ft. tall pyramid, a section of the Eiffel Tower Stairs and new Sundial with Michelangelo's "Arm of God". Major feature is the Granite Wall of the Ages (R). Gift shop is open from Thanksgiving to mid April. Hours daily are 10 a.m. - 5 p.m. Optional tour and certificate is $1. For more information, call (619) 572-0100. The remains of the adobe home of a Yuma pioneer. Jose Maria Redondo, can be reached by heading East on Highway 95. Turn North, at Ave. 7E, go over the Gila River, continue North for almost a mile where there is a gravel road that leads to an electrical relay station; another two blocks and the ruins are on the right. McPhaul "Swinging Bridge to Nowhere"
Located 18 miles North on Highway 95. Once bridging the great Gila River, this oddity now spans only shifting sands of the desert. An engineering feat, completed in 1929. The Golden Gate Bridge over San Francisco Bay follows this style. Given the name Dome Bridge, it was later renamed honoring an old timer, Harry McPhaul, who came to Arizona in 1897. He was a guard at the Yuma Territorial Prison, later a city police officer, then went into mining. It was because of his mining properties in the vicinity, the bridge bears his name. 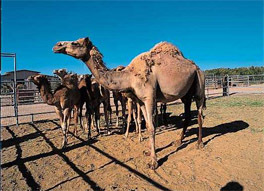 Enjoy close encounters with animals of the Arabian Desert and one of the largest camel herds in North America. Some include: Arabian Camels, Arabian Oryx, African Pygmy Goats, Asian Water Buffalo, Scimitar-horned Oryx, Watusi Cattle and much more. The farm is located on Avenue 1E and County 16th Street. To get there take 32nd Street east to Avenue 3E. Turn right on Avenue 3E and drive to County 16th Street for (5 miles), then right on County 16th and drive (2 miles) to Avenue 1E. The farm will be on your right. Tours are given twice daily, from Monday - Saturday at 10 a.m. and at 2 p.m., and on Sundays at 2 p.m. The farm is closed from June 1 to September 30. Admission is $3.00 per person. For more information and reservations, please call (928) 627-2553. Located 22 miles Northwest of Yuma , take Interstate 8 west to Ogilby Road exit, and drive north for 9 miles. Once a roaring mining town of Hedges, later known as Tumco, claimed 3,000 people in 1880. Between 1870 and 1909, Tumco mines poured out $11 million in gold and several saloons, two cemeteries, two churches, and a school, but little remains. Beware of open mine shafts, and a four wheel drive vehicle is necessary. Stroll through landscaped walkways and enjoy specialty shops and unique dining establishments. Experience the energy as the heart of Yuma is revitalized. Historic Downtown Yuma  where the number one priority is individualized attention and pleasurable shopping. Located within 80 miles of Yuma, scores of gem locations may be found. "Rock Hounds," will find happy hunting grounds for kaynite, garnet, tourmaline, talc, and alusite, pyrite, magnetite, agate, jasper, root and palm fiber, rhyolite, chalcedony roses, cat's eye quartz, petrified wood, etc. For specific information contact the local rock shops.